About Bedbugs — What are bedbugs and how to get rid of them. Most of us have heard the saying “Good night, don’t let the bedbugs bite.” It is an old saying which actually holds some affection, but one whose origin is based on facts. Bedbugs are small parasitic insects from the family Cimicidae. The insects from this family have as a defining characteristic: they feed on the blood of warm blooded animals. 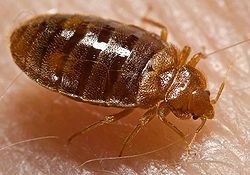 The term bedbugs is used for the insects which prefer to feed on human blood and usually live in the human environment, the term itself being a reference for their preferred nesting place in beds, sofas, easy chairs or other places where humans sleep. The common bedbug or Cimex lectularius, is the species best adapted to the human environment and is mostly found in temperate climates, but there are other species of bedbugs found in only certain regions of the globe. Cimex hemipterus is mostly found in tropical regions and are known to also infest poultry and bats. Leptocimex boueti is a species found mostly in West Africa and South America and which infest bats as well as humans. Cimex pilosellus and Cimex pipistrella infest mostly bats, while Haematosiphon inodora, found mainly in North America, infests mainly poultry. How can you identify a bedbug? An adult bedbug is a reddish-brown color, with a small flattened oval body. They do not possess wings. They are usually 4-5 mm in length and 1.5 to 3 mm wide. Bedbugs have microscopic hairs which lead to their banded appearance. Newly hatched bedbugs, known as nymphs, are translucent and have a lighter color than the adults. Their color grows darker with age, when they molt. Bedbugs communicate by pheromones and kairomones and so they transmit information about nesting locations, attacks and even reproduction. The lifespan of the bedbug varies from species to species but is also greatly influenced by the resources and the environment. Bedbugs are not nocturnal creatures, but they are mostly active at night. Proper hygiene is the key to combating a bedbug infestation. First, you need to change your bed sheets with clean ones once a weeks or even more frequently if you’ve had a recent infestion. Wash your bed sheets at high temperature with proper detergent to eliminate any small parasites. Second, you need to clean the bead and air the mattress at least every couple of months and we recommend that you air the mattress and leave it in the sun for one day at least once every six months. This will eliminate any small parasite, as well as eliminate excess dead skin which has accumulated in time. Finally, when you come back from a trip, I recommend that you wash all your clothes, because there is the possibility that a bedbug or another type of pest can reside in them. Wash your clothes at high temperatures, as bedbugs cannot survive over 45 C and all forms of life are killed by an exposure of 7 minutes at a temperature of over 46 C.
I found a safe nateral enzyme product that you can spray on mattresses, curtains and furniture along with another product that can be used in the wash for clothing. It dissolves the beg bugs and their eggs. You can go to http://www.jzimaging.com and contact them. The one product for the wash does not require hot water so you don’t have to worry about shrinking your cloths. It is very safe for children and is non-harmful. It worked great. It is a very low cost solution and I can use it when I travel to spray my luggage and hotel room. They have travel sizes. I recently went to a trade show and another vendor had bugs in their room and used it. All hotels were full so he would have never found a room in the current hotel. he was bug free the rest of the week. I was woundering what is this safe nateral enzyme product callled , and aproximently how much is it …? If your looking for an ALL natural product, check our Scram Bed Bug Products, they have a proven 100% percent kill and repel rate. I believe this website sells it as well. lately i have been getting bedbugs on every piece of furniture we have at the house and i am not liking this not 1 bit.!!!!!!!!! I moved in my new apt. on Nov.o1,2012. I had no furniture,but there was a perfect looking sofa & sofa chair already there,so the landlord ask if I wanted it & since I had none I kept it. I sept on that sofa from Nov.2012 til March 2013 because I was paying on my brand new bedroom set. I made my final payment on the bed March 15, 2013. But one night,not being use to the bedroom yet I fell asleep on the sofa. For the 1st time since I moved in I woke itching. I turned on the light to see what was repeatedly biting me & small bugs were on my arms,hands & around my neck! It freaked me out!! I ran in the bathroom took off my shirt,shook it over the sink and about 16 bugs fell out! I hurried up & took a show. But you know they weren’t in my hair. ***Why did it take them long to attack? Or did they & I didn’t know it? *** That furiture was sawed into and thrown away to burn. I’ve been uneasy about being in my livingroom every since.